Is Proof & Provision My New Favorite Bar? True, I like Holeman & Finch, but it takes aim at the semi-high-spending gastropub crowd and is a tad over-hyped (I admit, I’ve done my share of hyping). I mean, H&F has become a destination now, lauded by the AJC, listed in Food + Wine’s “Best Bars in the World/Country,” and written up in Imbibe and Southern Living, among others. Leon’s is a Decatur staple, and has a booze supply that can’t be beat, but it’s always too busy and too noisy. Those other cocktail bars around town? I get the feeling they’re really restaurants that happen to have cocktail programs. All well and good, but what was missing was somewhere you could just pop in, plop down, sip something great, and munch on hefty vittles to soak up the booze — the quintessential corner bar. Proof & Provision fills the gap. Nestled in the basement of the historic Georgian Terrace in Midtown, P&P is small, comfortable, and (relatively) quiet: perfect for conversing with your companions or — my favorite thing to do — pick the brains of the bartenders, who are friendly, knowledgeable, and as willing to drink PBRs as they are shoot Fernet-Branca or sip Manhattans. The spirits selection is dive bar in size but cocktail bar in quality, and the cocktail list is balanced between refreshing sours and reinventions of boozy classics. …and it’s delicious, but it’s best to let it warm up a little bit, just to thicken up some and to let the flavors warm up: when chilled, it feels a tad thin in the mouth. Overall, it’s a lighter, mellowed-out version of the V.C. that’s woody, slightly herbal and fruity with a nice background of flavorful spice. Friend Jack, on the other hand, tried out the Indian Summer — Purity Vodka, Leopold Blackberry Liqueur, lemon and orange juices, mint, and jam — which was light on the alcohol, fizzy, and refreshingly fruity. And here’s a tip on adding soda water: the guys here at P&P pour the soda and the shaken mixture into the glass at the same time; it seems to incorporate a little better than if you had simply topped off with the soda and then stirred it in. 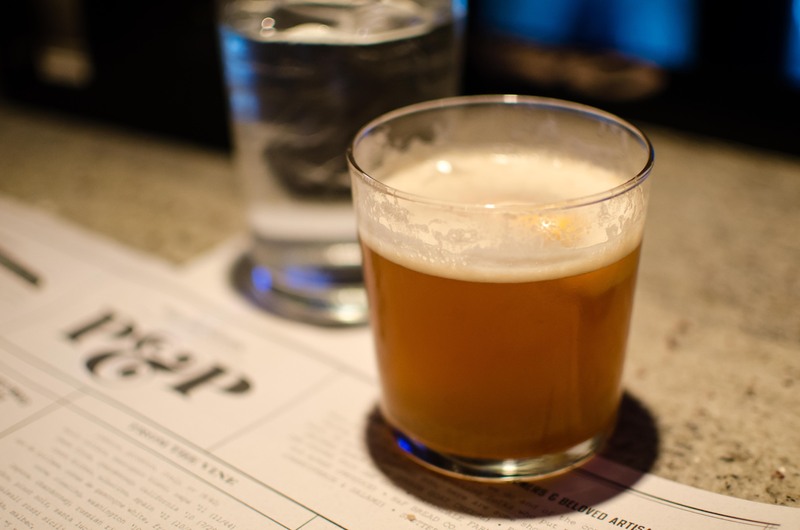 Jack also ordered the Southern 75, made with Four Roses Bourbon (rather than the gin or cognac found in the French 75), demerara syrup, lemon juice, and Finch’s Cutthroat IPA (in lieu of champagne). A bit more woodsy depth than the typical light, bright French original, with some nice flavors and edginess contributed by the hops in the IPA. Intriguingly, it arrives as a built drink, split into three subtle layers and stirred before quaffing. Very nice. My absolute favorite drink of the night, however, was the venerable Old-Fashioned. Surprising, but true. Lately, I’ve given up on ordering them as “test cocktails” at bars: the O.F. varies wildly depending on who’s making it, and most of the time it’s too watered down (wet ice) or the whiskey’s too weak (cheap) to really shine through. I just haven’t had much luck. 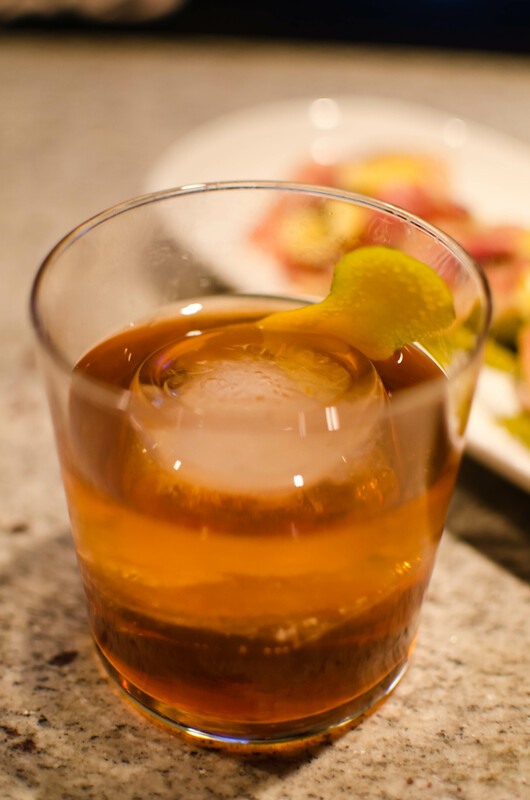 I don’t even make them at home very often, and for about the same reasons: many of mine come out too watery if stirred with ice and too boozy when poured, straight, over a giant ice cube. In the Old-Fashioned, more so than any other cocktail, proper dilution is everything. Bartender’s Choice: Best. Old-Fashioned. Ever. When I asked our bartender, Alexander, to whip up something of his choice (“Nothing bitter” being my only input), this is what came out: a blend of Four Roses and Old Forester Bourbons (or maybe it was just the Forester), Angostura Orange Bitters, Molé Bitters, and simple syrup, stirred with a large ice cube and then garnished with a flamed orange twist. Perfection. Absolutely the best Old-fashioned I’ve ever had, my own included. The syrup made the bourbon thick and rich without over-sweetening the drink while the bitters provided just the right amount of spicy depth; the flamed orange peel was especially zesty and caramel-y — I’m guessing the bitters played a major role in upping its qualities. Don’t know how he did it…guess I’ll have to pay more attention next time. Oh, and the food? 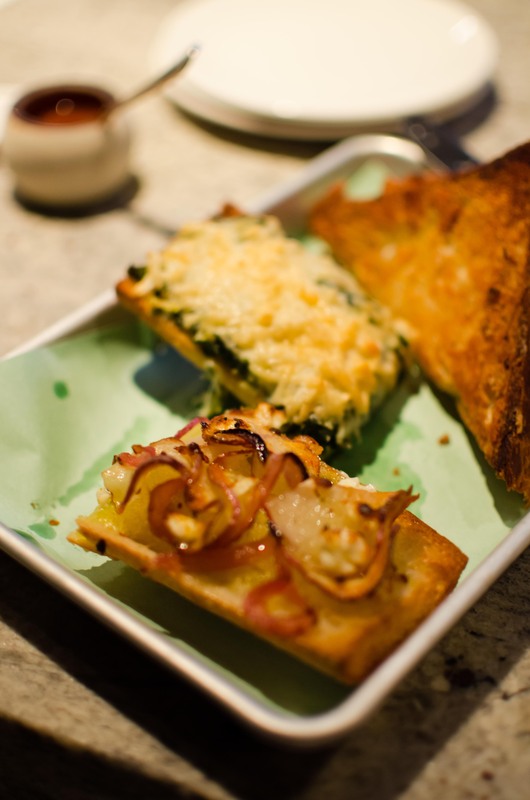 Hearty, amped-up takes on drunk-food classics. Pretzels? Check, and perfect (cover with mustard, dip in cheese sauce, chomp, repeat). Grilled cheese? Hot off the grill and delicious, especially when stuffed with bourbon barrel bacon and paired with a finger of whiskey. The french bread pizzas (all the bread comes from H&F — yes, them — Bread Co.) are also great, Harold’s Revenge being our favorite. 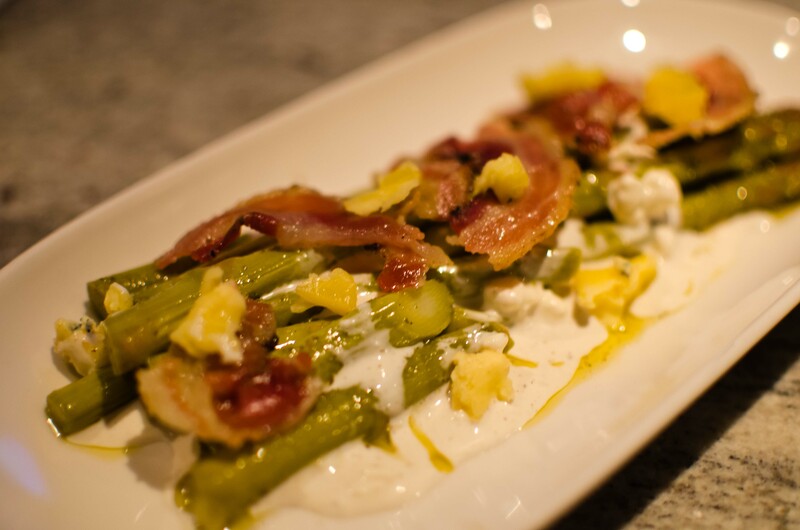 And the nightly special — asparagus, served cold, with bleu cheese and bacon — was top notch, something more likely to be found in the kitchen of the Livingston upstairs than in a corner bar. While there aren’t any entrees on the menu, you can easily assemble some small plates into a meal or divvy them up among party members. A nice bonus is the fact that all the plates cost the same or less than the cocktails, none of which top twelve bucks (most are $8-10). 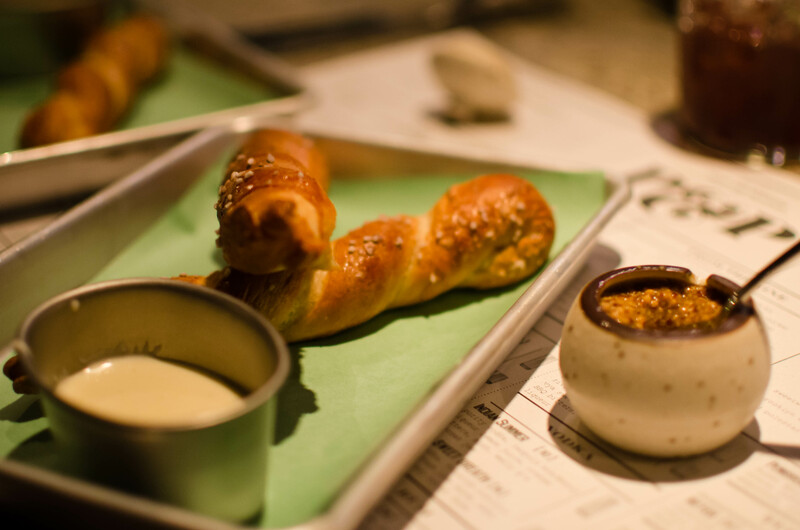 Anyway, the pricing brings me back around to my original point: Proof & Provision has stepped in as the kind of low-key, affordable neighborhood bar that seems to missing in Atlanta and around much of the South. P&P is not a beer hall, pub, or dive bar, nor is it a glitzy night club, a fine-dining establishment, or, Heaven forbid, a snobby Temple of Mixology — it lies squarely in the middle of the spectrum. Need booze and food that’s familiar and comfortable? No problem. Trying something new? 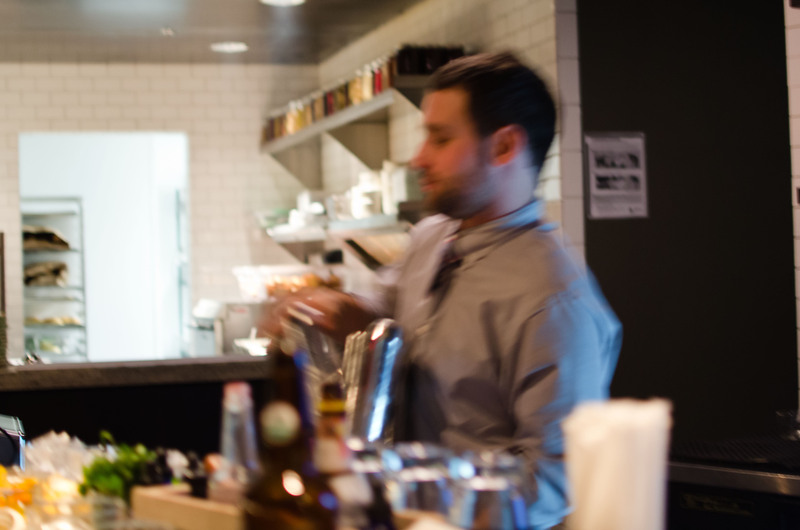 The kitchenette and bar can satisfy your curiosity; the bill won’t break the bank and everything is done well. I can see P&P being a neighborhood gem for knowledgeable and thirsty locals and regulars, easily missed by the theater-going crowds at the nearby Fox or seekers of the trendy nightlife — hopefully it stays that way. PS: Jon Watson, of the AJC, has a nice review of P&P, as does Cliff Bostock of Creative Loafing. Check ’em out. 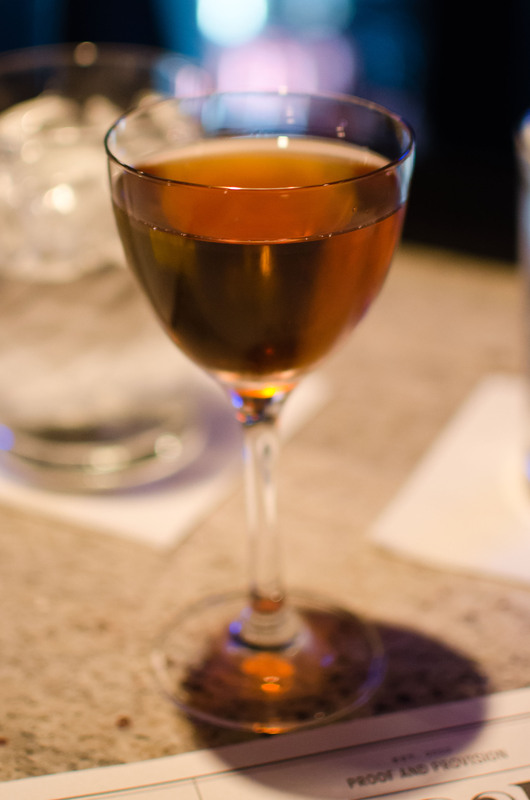 PPS: I had a glass of Amaro Nonino after all was said and done — very nice. Smooth and sweet, very heavy on the orange peel and not quite as bitter as Amaro Montenegro. Alexander suggests that it makes sublime substitute for Amer Picon in the Brooklyn cocktail. This blog is rock solid; I like your writing style good sir. Thankee, sir. We need to make a visit to P&P! 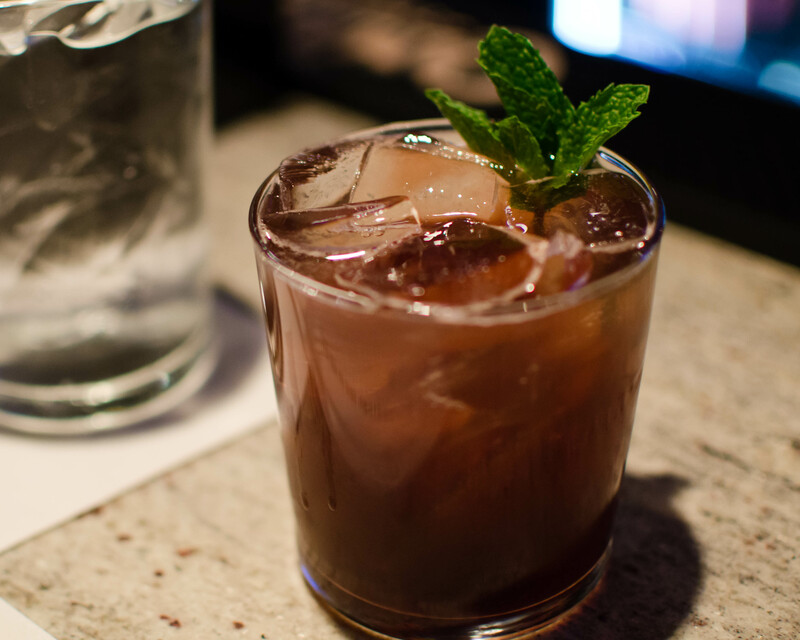 This entry was posted on November 10, 2012 by IJ Lauer in Atlanta Bars, Bar Visit and tagged atlanta, atlanta bars, corner bar, indian summer, notre carre, old-fashioned, proof and provision, review, southern 75.